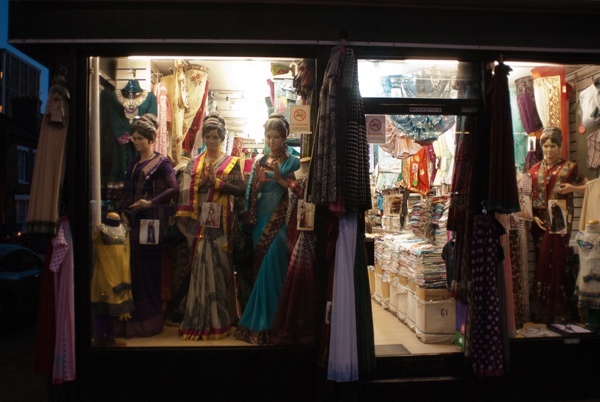 In these days, when it barely gets lighter than dusk and I walk around bent double in the driving rain, I find myself lifting my gaze occasionally in admiration at the illuminated windows of saree shops that cluster in Bethnal Green and Whitechapel. 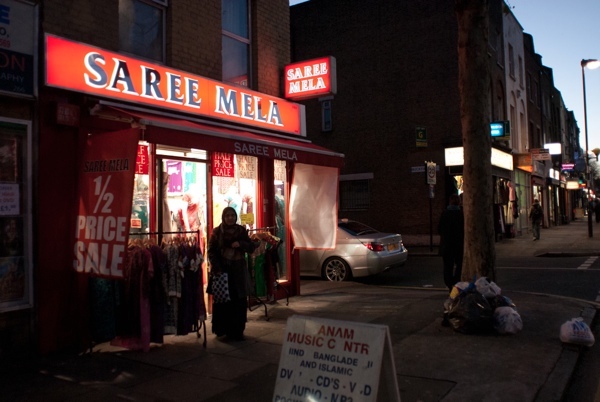 So, when Contributing Photographer Sarah Ainslie brought me these poignant images of saree shops glimmering with colour and light despite the pervasive gloom, I suggested we pay a few of these establishments a call and discover more of the world of the East End saree shops. 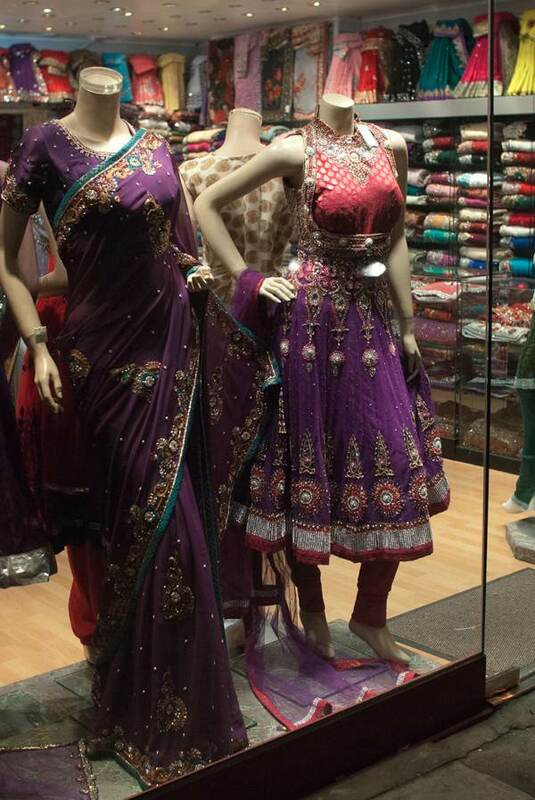 In Bethnal Green, at Zhara Fashion House we were greeted by three women, Majida, Shuheli and Afsana, who have just started in business one month ago, specialising in selling fabric lengths which permit their young customers to make sarees to their own patterns and thus avoid the ready made styles that fill the other shops. 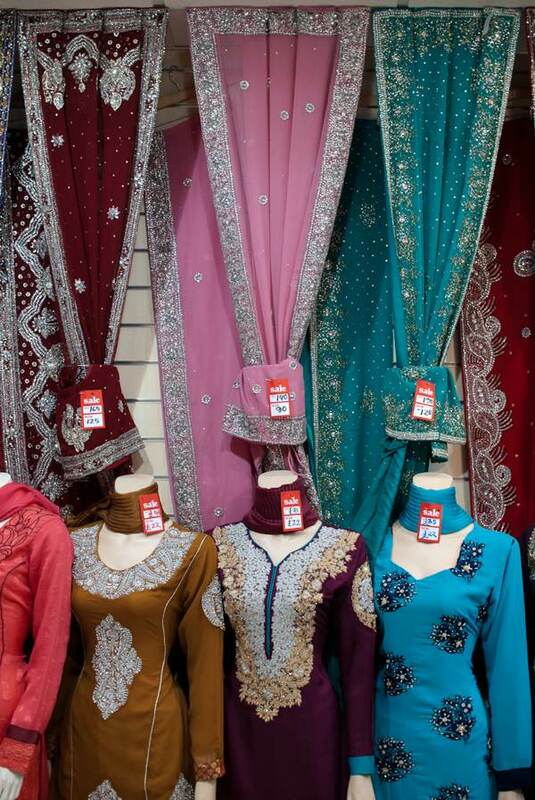 Their youthful optimism was in harsh contrast to Abdul Latif at Modhubon Ltd who had been trading for twenty-one years across the road in a shop stacked to the ceiling with sarees folded neatly on shelves. 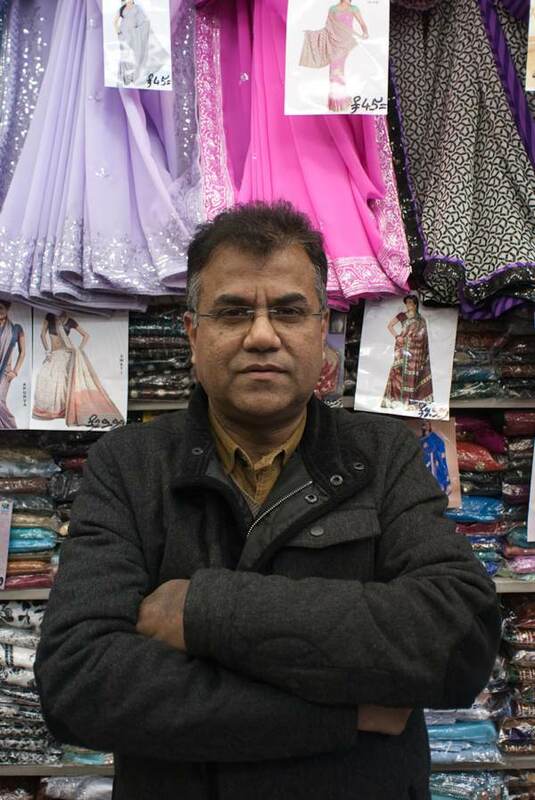 “I used to go to India once a year to buy stock, but not for the last three years,” he confessed with a frown, “I’ve had a very bad run.” Mr Latif’s customers are senior women who have been economising with their purchases, he revealed, and this week, far outside the summer wedding season, he was alone in his magnificently decorated shop like the host of a party to which nobody came. 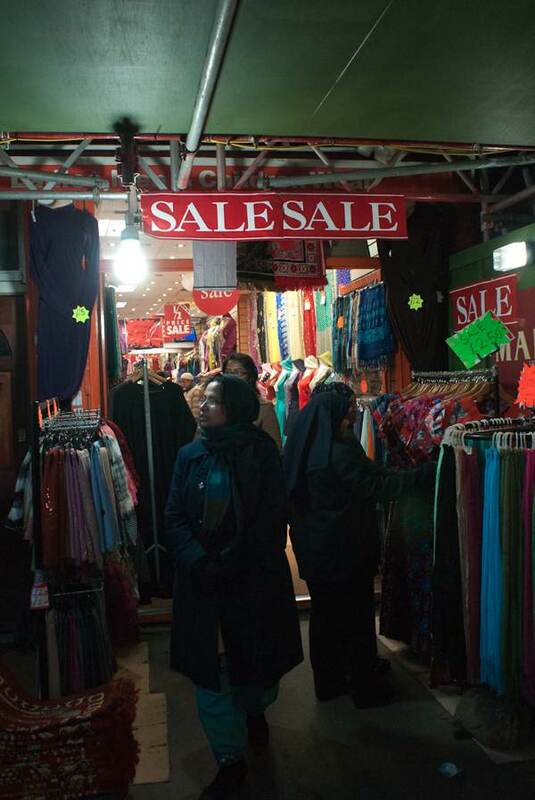 Yet just a couple of doors down, we discovered a brisk trade at Mahir where lots of saree bargains were to be had in the sale and the entire range of stock was accessible to the eager women browsing on rails. 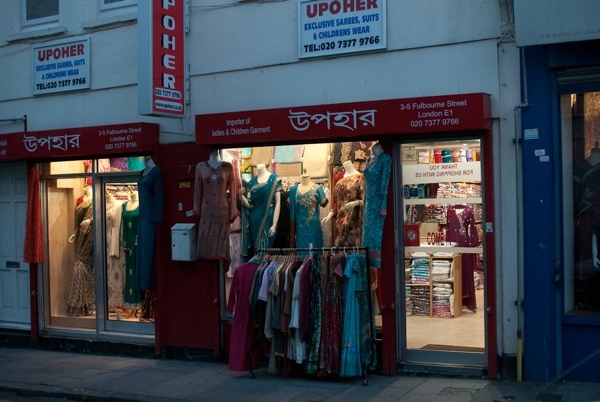 Sumsun Nahar Shirne, the briskly efficient under-manager, explained that this was one of seven branches scattered as far apart as Leeds and Luton, owned by her cousin Shurajul Islam Akbas. 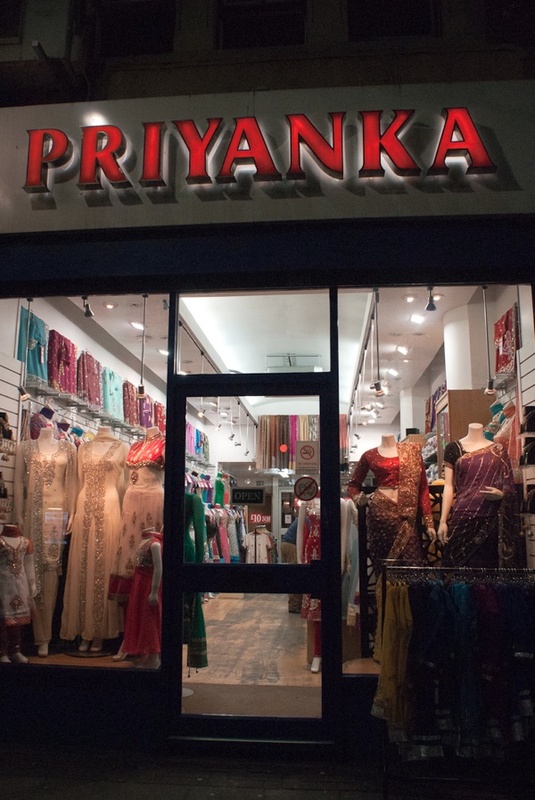 “Customers come from as far away as Germany, Italy, France, even America,” she bragged. 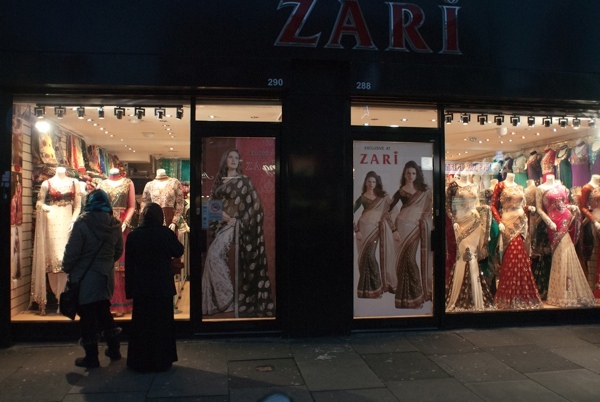 Similarly at Zari, next door, where Shofig Islam brought ten years of retail experience at Superdrug to the family business, there was no shortage of customers. 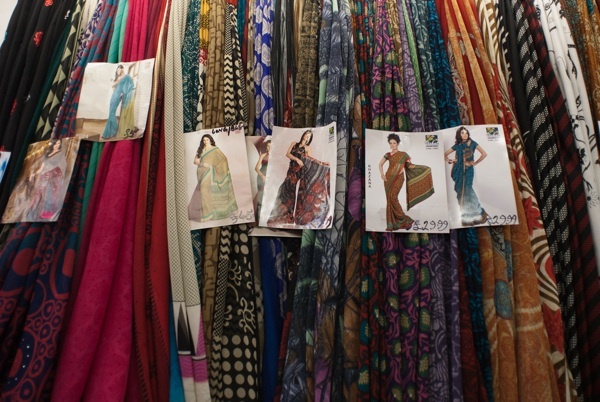 Shofig had an impressive array of vibrantly coloured glittering sarees, yet he was eager to stress that he stocked a wide range of different garments to suit the tastes of younger women who like to mix western and eastern clothes in their every day wardrobes and only wear full sarees for special occasions. 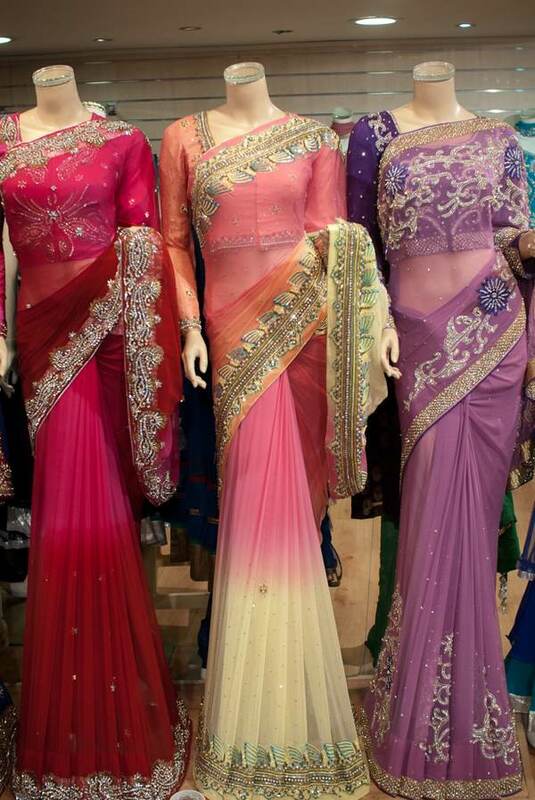 Alert to social trends, working closely with manufacturers in India to deliver the designs that women want and with his richly-coloured stock creating a dazzling display, Shofig admitted to me that he had been able to expand the business recently. 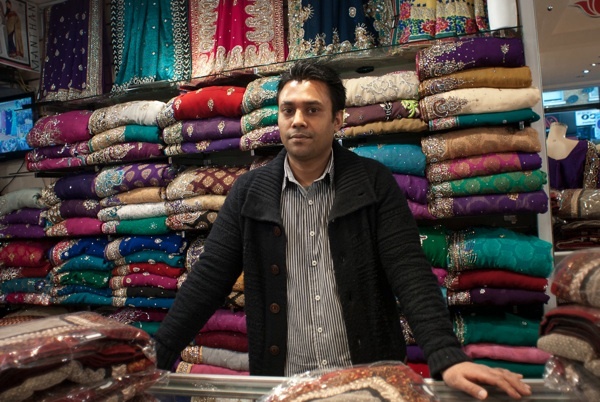 Taking the stroll down Vallance Rd, we set out to explore the saree shops shining in the shadows of the alleys leading off Whitechapel Rd and – among other delights – discovered the wonders of Zai, a compact traditional establishment where proprietor Helal Khan, who has been in business for ten years, welcomed us kindly. 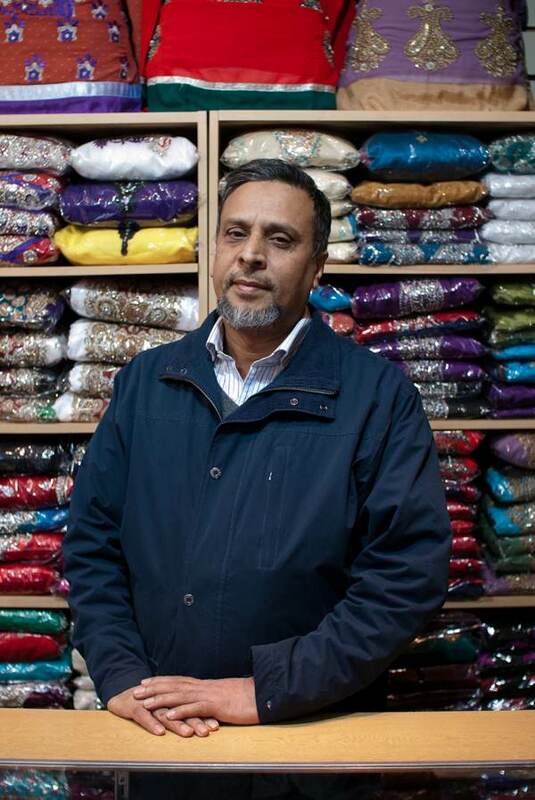 Mr Khan has a loyal trade of local women who frequent his discreet premises with its immaculately organised stock. 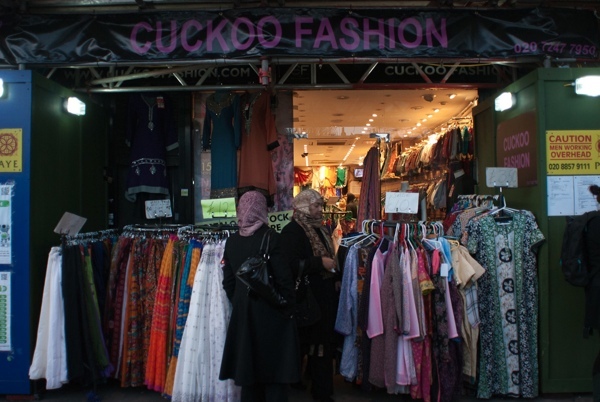 The dusk that had prevailed all day turned to darkness as the rain set in again and we just had time left to step into Cuckoo Fashions in Whitechapel Market, which we found remarkable for the selection of panels of richly patterned printed silks at just fifteen pounds each. 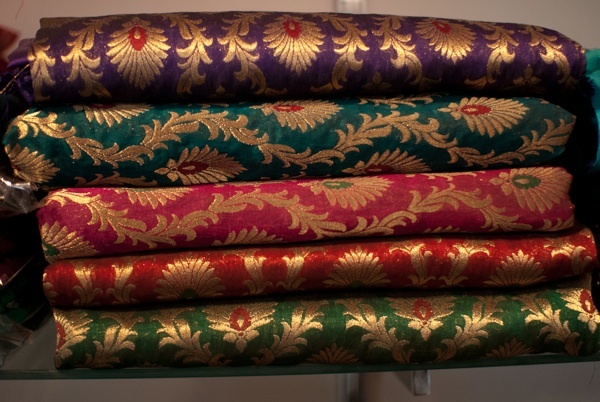 It was tempting to carry some away but we were spoiled for choice, as we had been all day by the sensuous hues and tinsel on display at every shop we visited. 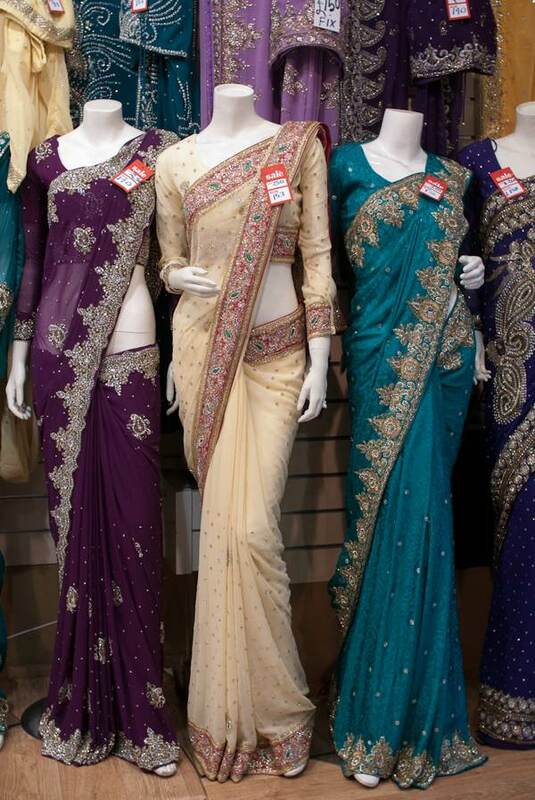 In spite of social changes, we were reassured that the saree shops will be with us for the foreseeable future to bring glitz to our dowdy East End streets. So we set off into the murk with our spirits lifted by the exposure to so much glowing colour and vowed to come back another day. 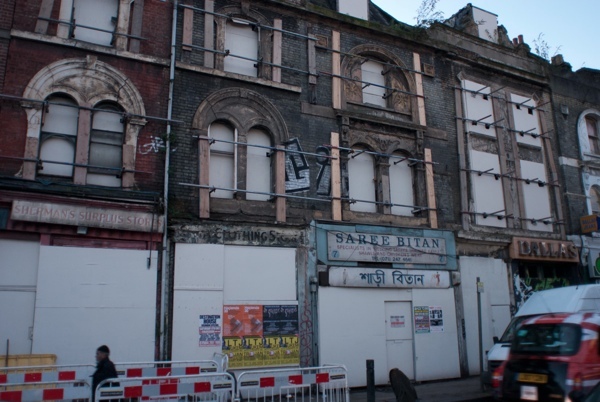 Helal Khan at Zai in Whitechapel. 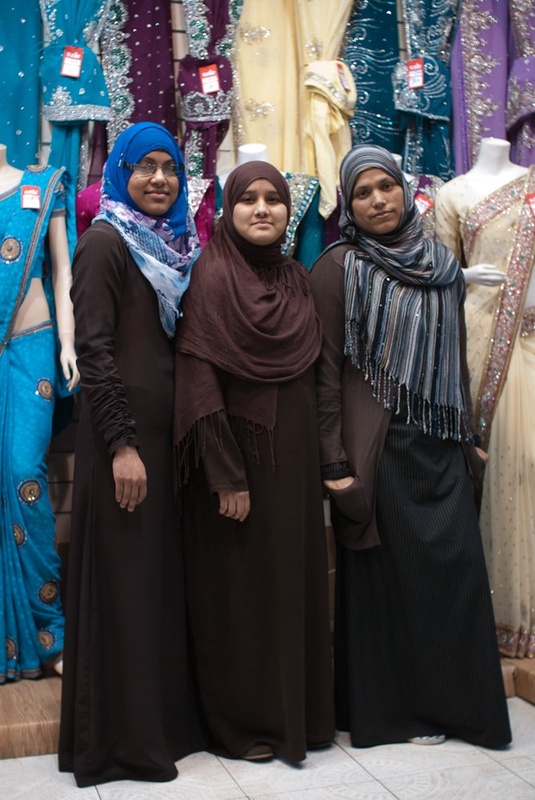 Fatima Chowdury, Jumara Noor Eli and Sumsun Nahar Shirna at Mahir in Bethnal Green. 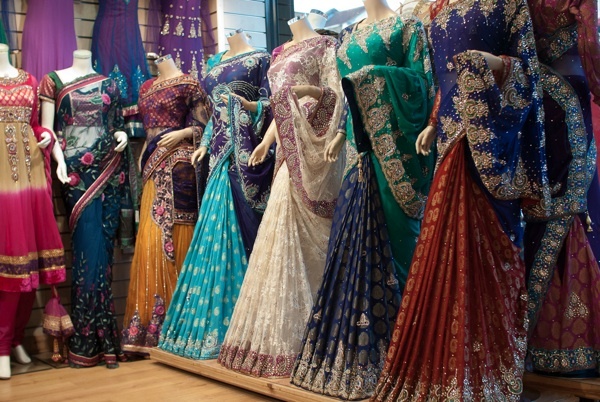 Whilst perhaps too colourful ever to be the New Black, they’re certainly more elegant (and forgiving) than leggings. 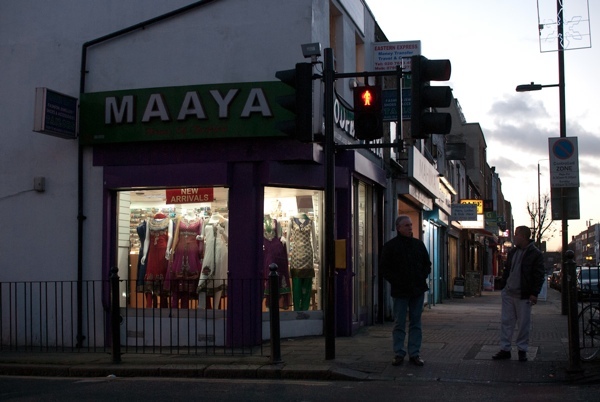 Maaya, on the corner of Bethnal Green Road and Ballance Road has been a ladies’ clothes shop before. 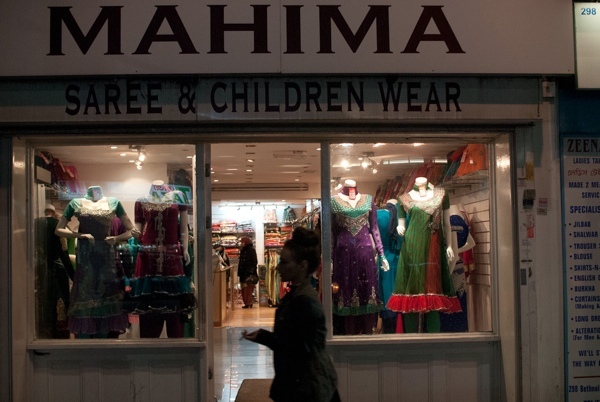 Back in the 1960s when I was a child, my nan worked there. 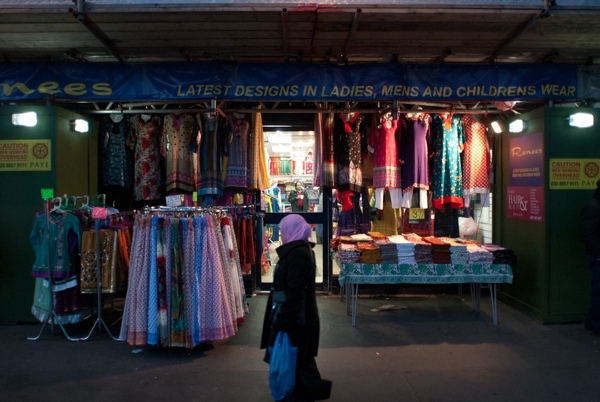 The shop was called Leslie’s and sold dresses and blouses, skirts and jumpers. 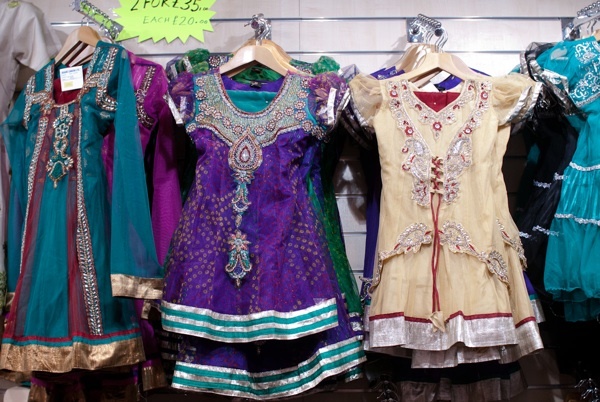 There was old fashioned glass counters one of which contained chiffon blouses of every colour in the rainbow. 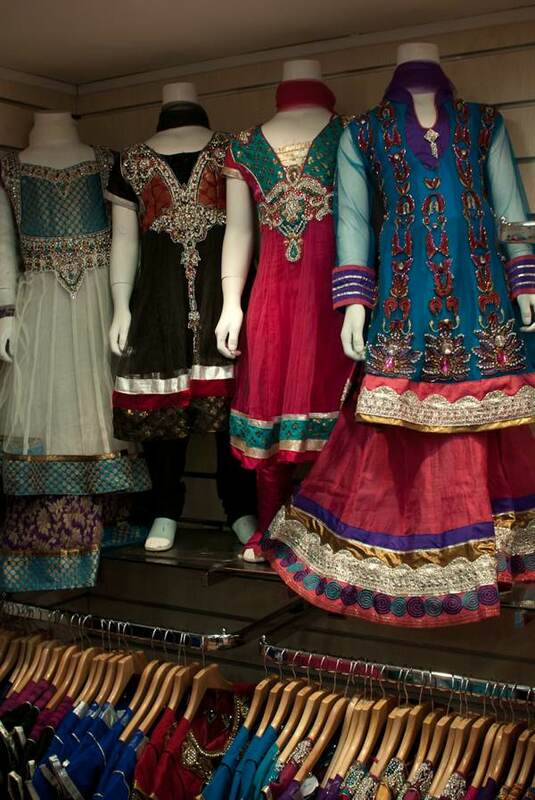 I loved sitting behind the counter when I was there. 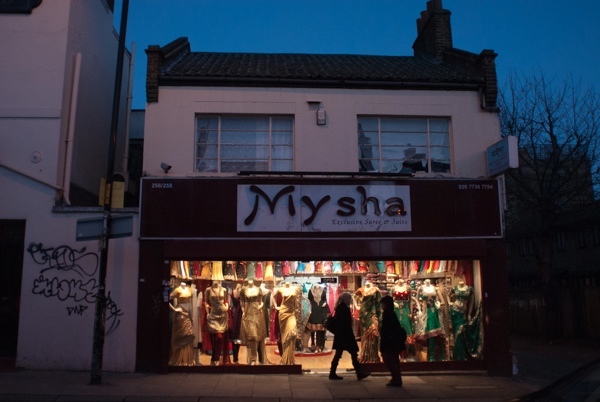 After it closed, it became a pram shop. 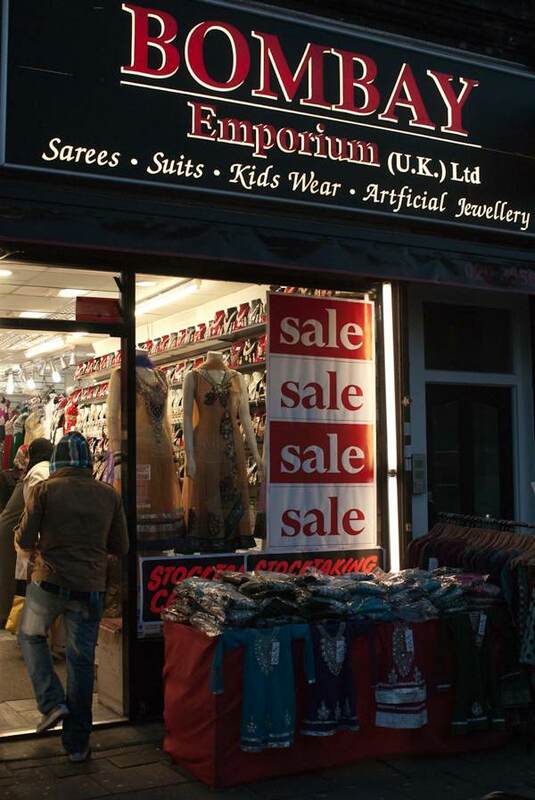 It’s nice to see it being used as a clothes shop again. How can you resist? 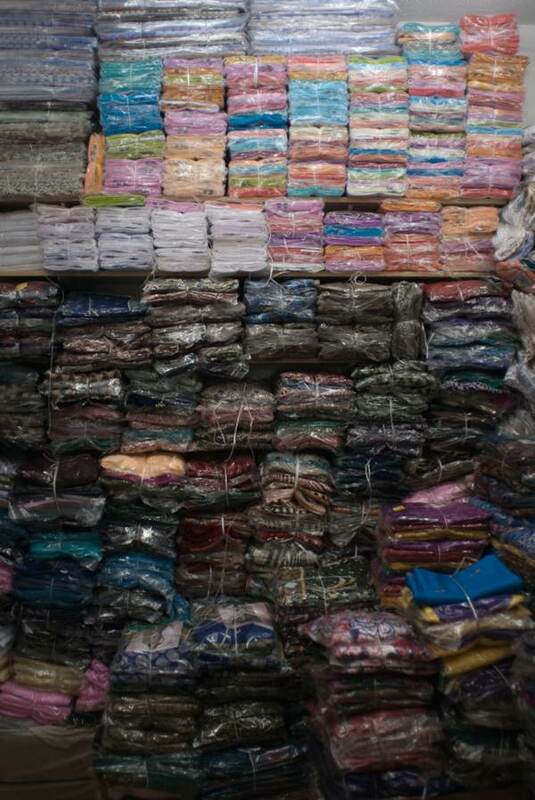 I’m an absolute fabric magpie! 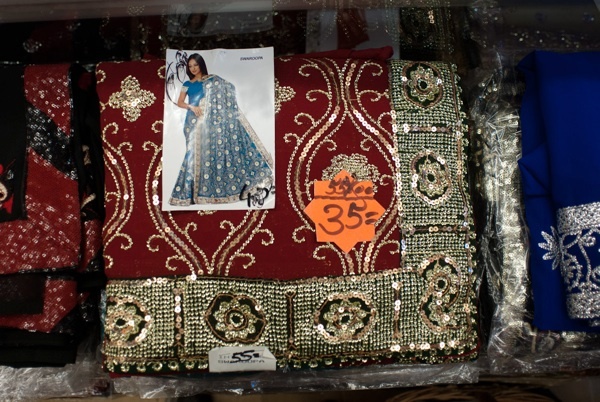 beauty in every sequin and every merchant’s smile. Optimism abounds. Many thanks – I needed that today. 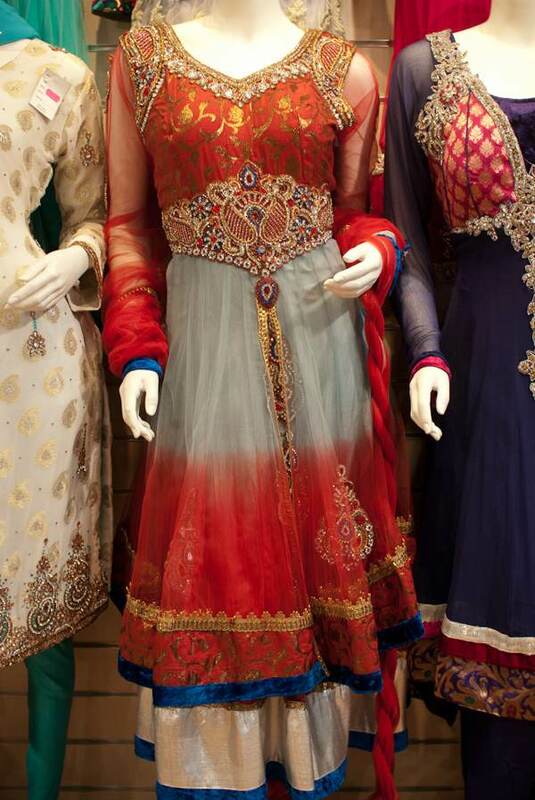 Amazing, Beautiful pictures on the fashion! 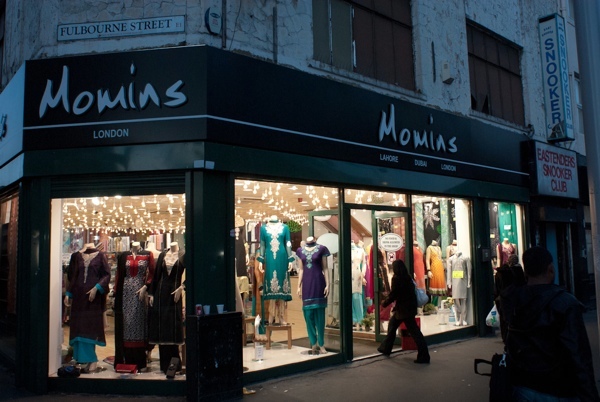 I would Love to go through this Wonderful stores! Thank You So Very Much! !